It seems unlikely doesn't it? ...but then so many of his plays are set there (13 in fact, that's a third), and characters and plots are inspired by Italian sources. Of course it's an excellent excuse for the anti-Stratfordians to argue that Will never wrote the plays because there is no evidence that a lowly glover's son from a tiny Warwickshire town could ever have travelled there. On the ThoughtCo.com website, Lee Jamieson wrote in May 2017 of new evidence that suggests Will may have visited Rome between 1585 and 1589. A 16th century guest book records three instances that could be related to our man from Stratford. The link may be a bit tenuous but I would argue that just because there is no hard evidence at all as to what Will did during these years, there's no reason why this couldn't be considered. Perhaps even the soldier story (brilliantly explored in Duff Cooper's Sergeant Shakespeare, 1950) and the pilgrim story might connect? After all Christopher Marlowe was a secret agent, but the fact that we know this could suggest he wasn't very good at it, whereas Will was so good as a spy we still don't know about it! I digress. 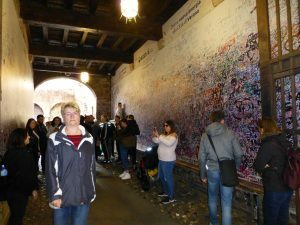 What prompted this blog was that last week I was in three Italian cities closely linked with Will: Verona, Venice and Florence, where I started my trip. 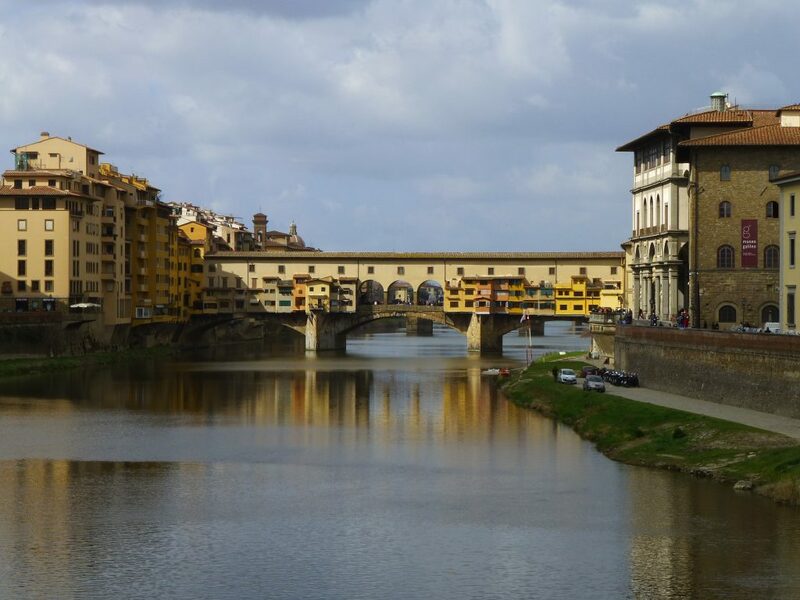 For Will and his Elizabethan compatriots, Florence was the mecca of the artistic world - the cradle of the Renaissance. This is where the explosion of learning and of art started just 100 years before Will's birth. It was here that scholars, artists, theologian, artists, scientists and even businesses began to look at human life and the world around them in a completely new way. Perhaps the most obvious example that captured the essence of this rebirth is Michelangelo's David. Never before had the human body been represented so accurately (minus his slightly large hands). In doing so Michelangelo asked his audience to reconsider how they viewed themselves in the modern world - their strength and their fragility, their mortality and immortality, all at the same time. Florence features in just one play - All's Well That Ends Well - though you would hardly know it. Whereas from the pages of The Merchant of Venice we can see, hear and smell the canals and tiny twisting streets of this this mysterious and mercantile floating city. The Rialto may be full of tacky souvenir shops today but I felt its business, at the centre of Venice's trading district would not be greatly dissimilar from that described in Will's play. 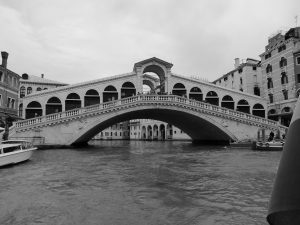 He refers directly to the merchants on the Rialto several times, Lorenzo and Jessica elope in a gondola and he also mentions 'the tranect' which could well refer to the 'tregetto' ferry which today still take people to the mainland across the lagoon. walking the streets - a a veritable spaghetti of interweaving alleyways and bridges; a plethora of dark corners and hidden doorways. 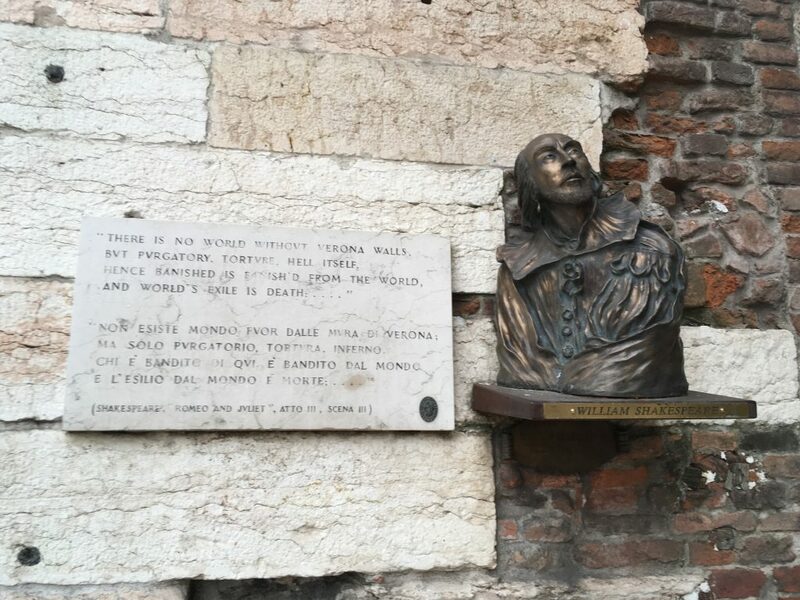 At night the city feels completely different from the day - one of intrigue, whispers and shadows, which Will perfectly captures in the dialogue of Salario and Salanio's taunting of Shylock, Jessica's elopement and even Gobbo's terrible ill-treatment of his own father. A similar atmosphere is created at the start of Othello with Iago and Roderigo. 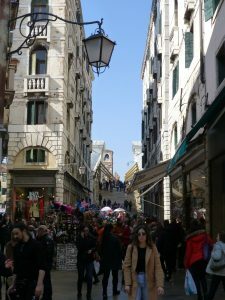 On the other hand, there is the glitz and glamour, the charm and elegance of Venice's designer shops, glassware, 100 Euro gondola rides, be-suited waiters serving ludicrously priced cocktails in harry's bar. This swill of wealth and showiness is captured perfectly in the characters of Gratiano, Bassanio and Lorenzo. 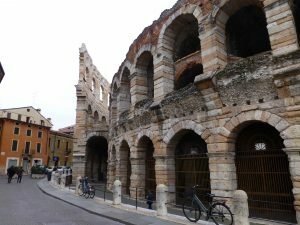 I took a day trip from Venice to Verona (had to really didn't I?). On my route I passed through another town that inspired Will - Padua - the home of Katherina Minola, the setting for The Taming of the Shrew. The great university town of northern Italy. 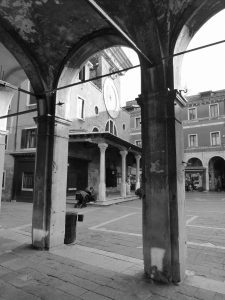 In fact in the 1500s it was as well known to Elizabethans as say the Sorbonne in Paris is to us today... but I only saw the station, my destination was Verona. 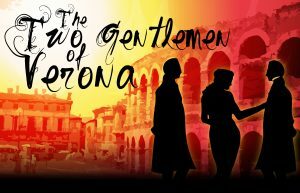 Will set two of his plays in Verona: Romeo & Juliet and The Two Gentlemen of Verona. The latter starts in Verona, described by experience-hungry Valentine as a bit of a back-water, and quite quickly moves to Milan. I didn't meet Proteus, Julia, or Lance and Crab, but I did manage to get a photo of the Roman Arena that we used on our poster for the show in 2009. 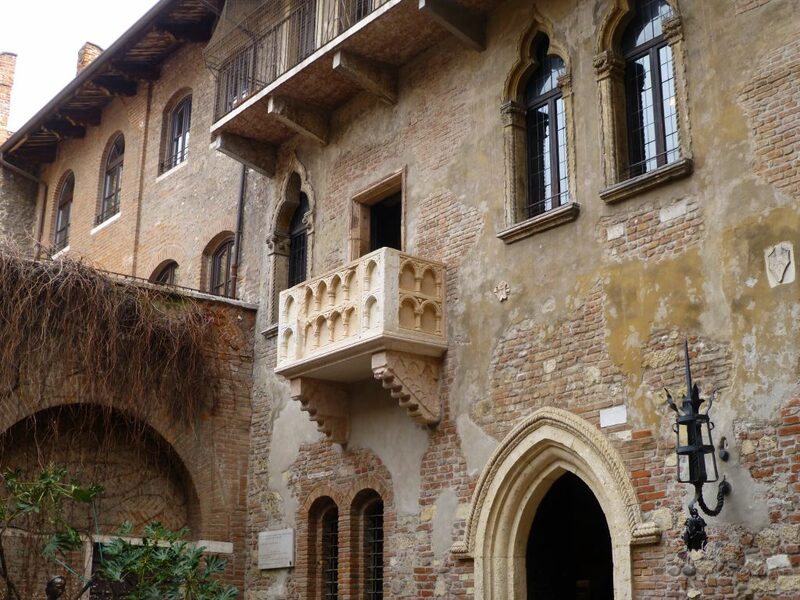 Of course, the big pull here is this place: Casse di Guillette - the House of Juliet. The building can be traced back to the Dal Cappelo family in the 1200s, from which the Capuletti family is derived. The house, still carries the family shield, though the balcony is an addition from the 17th century, and is actually a former sarcophagus. Just being here struck me of the awesome power of Will's work: this (and the tomb in San Francesco al Corso, Franciscan Monastery) has become a pilgrimage destination for millions of people from all over the world, throughout the centuries since Will's play. The graffiti walls of the entrance are a striking reminder of this fact. 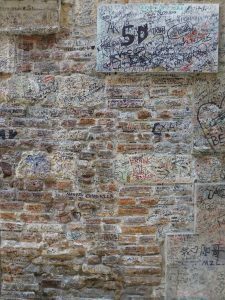 Over the centuries, millions have scrawled their names, their lovers' names and heartfelt declarations to these walls. 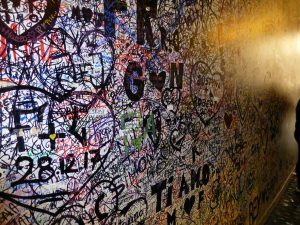 In fact it got so bad that the Verona authorities have had to declare a fine of 500 Euros for anyone found writing on any walls other than those designated. 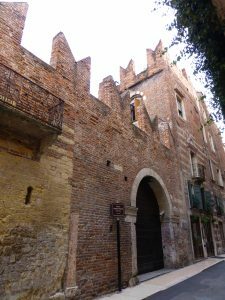 But perhaps what really captured my imagination in Verona was just a two blocks away in a narrow side street. The House of Montague - Romeo's home - would completely pass you by if you didn't slow down and look closely at the (again) graffiti-ed doorway. I sat and had a prosecco (when in Verona...) at a small bar on the corner of Romeo's street (ala Mercutio and Benvolio), looking across the road into the Loggia - the seat of Verona's government, and it made me think how intense the real rivalry must have felt between these neighbours, played out literally under the eyes of the law. The poet Dante, who made Verona his home for many years whilst in exile from Florence at the start of the 1300s, refers to the feuding families of the Cappalletti and Montecchi in the Purgatorio section of Divine Comedy (Book 2), where Dante laments the collapse of civil order in the Italian lands of the former Roman Empire. The millions of hearts, names and declarations of love that adorn both houses again brought home to me the impact of Will's work, on a global scale. But did he ever come here? maybe we'll never know for sure. Perhaps he just fell in love the stories from travellers and merchants, their names and writings that were filtering into English literature. Perhaps by setting his stories 1000 miles away was a way of handling topical issues under the guise of a 'foreign' story, on the edge of Europe, in a country known for heated rivalries. Perhaps it was a clever thing to do to choose the in vogue destination of the time. Whatever it was, and judging by the crowds I was part of, Will was clearly intoxicated as we are today by this beautiful and passionate country. Beautiful rhetoric-Also may I add I loved the photos to complement the story. It brought the vision to life. Thank you Erica! Glad you enjoyed it.